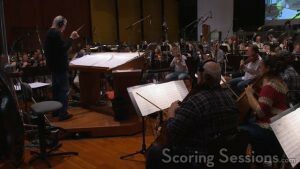 Courtesy of Walt Disney Animation, we have EPK b-roll footage of Michael Giacchino scoring Zootopia! The audio on the video is a bit variable, and primarily on the left-channel, so be advised. Still it’s great to have a fly-on-the-wall view of them all at work! We do have a few things in the works here at ScoringSessions.com. Coming up we’ll have coverage of Trevor Morris’ Of Kings and Prophets, John Ottman’s X-Men: Apocalypse, John Debney’s Ice Age: Collision Course, Theodore Shapiro and Ludwig Göransson’s Central Intelligence, and more! So be sure to check back and see what’s new.